I’m sure I’m not alone in being fed-up from a fortnight of friendly fixtures, looking forward to a return to league competition as the Bulls visit Rio Tinto tomorrow night. I am, though, still quite giddy over the sight of Henry lifting the Emirates Cup on the pitch at Ashburton Grove this past Sunday. I know many found the exercise meaningless but all these friendlies have been anything but futile, as they give us all hints of the future of football both foreign and domestic. A farce, tailored by Umbro, take the pitch this afternoon at Old Trafford, claiming a rebirth of New York’s most fabled soccer franchise. Am I the only one who finds it insulting that the team that played in our house just last week will play host to a group of amateurs and retirees who claim to represent New York? Something tells me the Devils won’t annihilate the competition today as they did in their games against MLS sides in July. 0-7 at Seattle, 1-3 at Chicago and then 0-4 at Red Bull Arena in the All Star Game all served to demonstrate Sir Rednose has his side ready for the start of the Premier League season next week. Midseason MLS sides usually perform much better against Eurosides in preseason training. How can Manchester United defeat the top talent in Major League Soccer and then, just days later, the New York Red Bulls draw at the Arsenal? The answer’s simple, if not readily apparent: some friendlies are more friendly than others. One side was playing a friendly last Wednesday in Harrison while the other were playing to win. And that’s not just a matter of always playing at your highest level. ManU set out to insult and overwhelm MLS support. In short, they weren’t the most hospitable guests. Meanwhile, with Wenger and Backe willing to trade Henry for ten minutes at the end of the match, only to be denied by the referee, a result was beside the point. Would Titi playing for both sides have made the match a farce? Clearly, that’s what the referee thought, citing FIFA regulations. 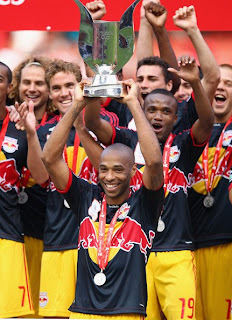 Henry set up the tournament winning goal in the minutes he would have been wearing an Arsenal shirt, so while he lifted the cup, he was denied an fantasy moment like the one Pelé enjoyed in his farewell match at the Meadowlands, playing one half for the Cosmos and one half for Santos. Perhaps someday in the future both clubs will get clearance from FIFA to allow him to wear a Bulls shirt one half and a Gunners shirt in the other (sorry Barça). Fortunately for New York soccer fans, Henry’s not yet ready for his testimonial. But Paul Scholes is. And we can watch this afternoon on Fox Soccer Channel as the Paul Scholes Testimonial is “presented by Umbro.” My hatred for ManUre runs deep. Unfortunately, I’ve a number of friends who support the Devils. If I didn’t, I could have sold my AllStar tickets to subsidize a trip over for the Emirates Cup. Alas, it wasn’t in the cards. Maybe I should re-think those friendships! The Theatre of Dreams has all-too-often played host to nightmares to this Gooner. And how did I become one? Because in 1985, this New York soccer fan lost his team. I went to college and kept playing but stopped following the Beautiful Game as a fan. Until New Year’s Eve 1994, when I took a trip to the Home of Football, Highbury, and fell in love with the Arsenal. I didn’t have a hometeam to support and when I moved back to New York in ’95, the emergence of the Internet allowed me to keep up with the Gunners despite the distance. With news of the Empire Soccer Club playing at Giants Stadium in a new domestic league, I was excited to renew my passion for live top-flight soccer. And when the New York/New Jersey MetroStars were announced later that year (on my birthday), I became a football bigamist. I always wondered how I would react if my two teams faced one another. My kids enjoyed arguing over such a fantasy scenario for years. Sunday, I finally found out. I was pleased to see van Persie score but my son took much more delight in Arsenal’s dominance than I could. When Henry set up the goal to draw level, I went mad with delight and pride. I wanted a draw, and got just what I wanted, with the added thrill of seeing my favorite all-time player lift the highest profile trophy we’ve yet won since top-flight soccer returned to the region in the mid-90s. Winning the Western Conference was a tremendous night at Nevada Smiths, but with a strong sense that the big test was to come against the Crew (one we failed, of course). And who saw us lift La Manga or that Disney trophy? While some English pundits accused Backe of having the boys park the bus, the day before against a loaded Paris Saint-Germain we played lovely football (“the Arsenal Way”). New York winning against Paris in London. Priceless. But today there’s that other friendly, where a side assembled just for this one occasion will claim to represent New York on an English pitch. Claiming the name of the team I lost in the mid-80s. Who will I root for? Neither side. While I wanted a draw with Arsenal v Bulls, I’m not sure what result, if any, could please me. A former Tottnumb Vice Chairman and a former Chelsea masseuse have handed the reins to Kung-fu Cantona. “Tailored by Umbro,” indeed; I cannot see the Kemsmos switching into adidas gear and kissing Carl Johnson’s Anomaly goodbye for Soccer United Marketing and the collective kitty that is MLS and single-entity. Nor can I ever see yet another sports venue built in the five boroughs. But at least Peppe Pinton keeps his Cosmos Camps. So much for the grassroots. Umbro’s pumped millions into this project because Nike is pissed over the MLS/adidas partnership. So what better way to flip the bird to Garber and Co. than to have a non-MLS side play at Old Trafford (and "earn" a better result than any MLS competition could)? So I won’t be celebrating a revival of the Cosmos. That should have happened a long time ago, and would have had Pinton not denied New York’s soccer fans the right to celebrate the legacy. He wouldn’t let the MetroStars or the Red Bulls become the Cosmos, despite approaches to make that happen. The events held by the MetroStars/Red Bulls that celebrated the Cosmos legacy padded Pinton’s pockets, but still he offered the brand to Philly before Kemsley paid his ransom. Years of futility in MLS have seemed like karmic retribution for the triumphs enjoyed in the NASL. And now that Giants Stadium no longer hosts the ghosts of our glory days and we’ve finally a home of our own, our glistening Cathedral to the Beautiful Game at Riverbend, we’ve had to share media attention with a team that hasn’t played in a quarter-century. Now wannabe hipsters have embraced the brand as a sign of anti-suburban soccer aspirations. Because of course the Cosmos have nothing to do with dirty Jersey. The distractions continue as the legacy is stolen and reconstituted. Something tells me the match at Old Trafford today will seem a little more friendly than what we saw last week from the Devils, despite the blend of kids and retirees in Umbro threads. The future of New York soccer is at stake as its past is up for grabs. Fantasy or a farce? Time will tell.